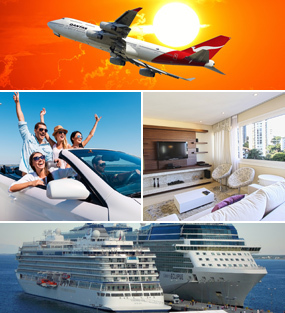 Plan vacation or business trip with eTravel.com and search best offers, cheap rates and discounts on hotels rooms in Los Angeles. Find your next great offer and book your perfect hotel in Los Angeles. On this page we give you information related to hotels and activities available in Los Angeles, California, United States. What is the Los Angeles City? The second largest city of America, Los Angeles is truly the 'City of Angels'. Home to Hollywood, one should expect everything to be ostentatious in this Southern California city. The iconic Hollywood sign on Mount Lee, visible from several miles, welcomes visitors with all its warmth. The Hollywood Walk of Fame, Sunset Boulevard, and the renowned TCL Chinese Theatre bring you as close as it gets to all the movie stars and other celebrities. L.A. has a lot to offer for those who are not in awe of the famous celebrities too. Santa Monica Pier is lively and entertaining with several cafes, restaurants and live music all around. Away from the city hustle, get on a riveting bike ride from Santa Monica to Venice beach. The Venice Beach Boardwalk has a promenade full of artists, live performances, food stalls and vendors, ensuring you have a great evening with family and friends alike. Los Angeles also boasts of several amusement parks and attractions making it a perfect destination for a holiday with kids. Take your pick from Universal Studios, Disneyland, LegoLand, Six Flags Magic Mountain, SeaWorld, and many more. What are the Popular Attractions in Los Angeles? Hollywood Walk of Fame and the Hollywood sign undoubtedly stands on top of the list of attractions. Water lovers can head to the palm trees lined Venice Beach Boardwalk or Santa Monica Pier for a day full of fun and frolic. Beverly Hills is home to top actors and other celebrities and Rodeo Drive is a shopping paradise, from luxury brands to exclusive high end boutiques. There’s also Disneyland and Universal Studios for families traveling with children. Art aficionados will love to take a trip to Los Angeles County Museum of Art and J. Paul Getty Center. For those who want to stay in the lap of luxury, a five star stay at Beverly Hills is ideal. You might be lucky enough to catch a glimpse of some celebrities during your stay. For an offbeat and relaxed stay, book a beach resort at the Long Beach. Families can book a suite near LA’s several theme parks and other attractions. Downtown LA is the historic heart of the city that has recently re-birthed as the business is booming, has great nightlife, yet it is reasonably priced. Los Angeles is a metropolitan city and hence quite big, so hiring a car to travel around is a good idea. The 405 freeway is perpetually congested. So its best avoided or check real time travel update and then embark on it. Plan your itinerary beforehand and decide what attractions and areas you want to cover, so as not to waste any time wandering in the huge city. For public transport, get a Metro Pass that covers the rail line as well as the public bus services. To get up and close look of the locals in Los Angeles, head to Los Angeles Farmers Market. The place has great options for cheap dining and is fabulous for people watching. If you intend to visit multiple amusement parks and attractions, it is better to buy multi-attraction discount pack as the park admission fees is quite steep.